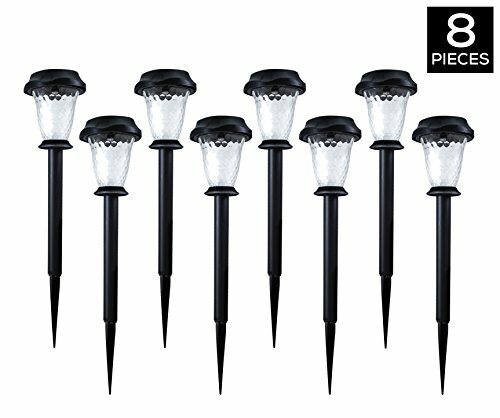 ✔ 8 STAKE LIGHTS POWERED BY THE SUN - No wiring or plugging in needed. The solar panels on the top of the light are all these solar pathway lights need to operate! install the path lights and wait 10 sunlight hours for best functionality. 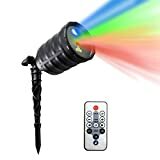 ✔ EASY INSTALL - Installation is as easy as activating the battery and pushing the included highly durable stake into the soft soil in your yard to enjoy effortless yard lighting! 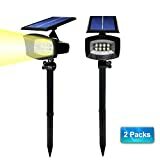 ✔ AUTOMATICALLY TURNS ON & OFF- Solar powered and battery operated, these LED pathway lights turn on and off with the setting and rising of the sun. There is no wasted energy, as the LED light will only illuminate at night. ✔ FULLY WEATHERPROOF - Once closed and sealed, these garden solar lights are resistant to rain, snow, wind, and harsh sunlight. Leave the landscape pathlights out in the front yard all year long for beautiful light! ✔ ONE YEAR WARRANTY - Take no risk by ordering now. Our solar garden path lights are covered by a one-year unlimited warranty. Your satisfaction is guaranteed! Contact us for an easy and fast replacement. Hyperikon’s LED solar path lights are a great addition to any type of lawn and landscape lighting. These fixtures are solar powered, so that means no plugging in or turning on. The single diode casts a beautiful crystalline glow of light, minimizing energy use while making your yard look great. The sturdy design is waterproofed for safe year-round use outdoors in all of the elements.